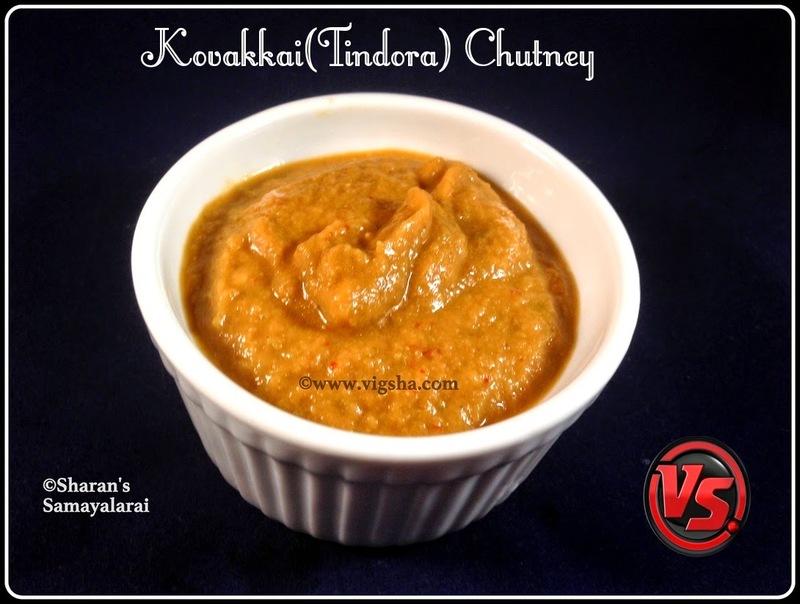 Kovakkai Chutney is a simple accompaniment that goes well with tiffin varieties. Kovakkai has good health benefits, do check Kovakkai Poriyal recipe which I have already posted. It is a good source of several micronutrients, including Vitamin A and beta carotene. It has also been used medicinally in Ayurvedic practices in India as an anti-oxidant, anti-triglyceride, and anti-bacterial. Tindora has been used to treat jaundice, abscesses and high blood pressure. 1). Wash, clean the kovakkai and cut into thin slices, set aside. Avoid the matured ones, they look green outside but reddish inside. 2). Heat oil in a pan and add cumin. When cumin splutters, add chopped onions and saute till the onion turns slightly brown. 3). Add the red chillies along with kovakkai and salt. Sprinkle little water and let it cook covered till the kovaakkai becomes soft. Keep stirring in between. 4). Once the kovakkai becomes tender, switch off the flame and let it cool. Then add tamarind (I have used tamarind paste) and grind it till smooth adding little water if necessary. Serve this tasty chutney with Dosa or Idli vaieties.